Just a little touch of Fall goes a long way for me. Add just a little bit here and there, keep the existing basic arrangements and color schemes, and voilà, Fall decorating is complete. 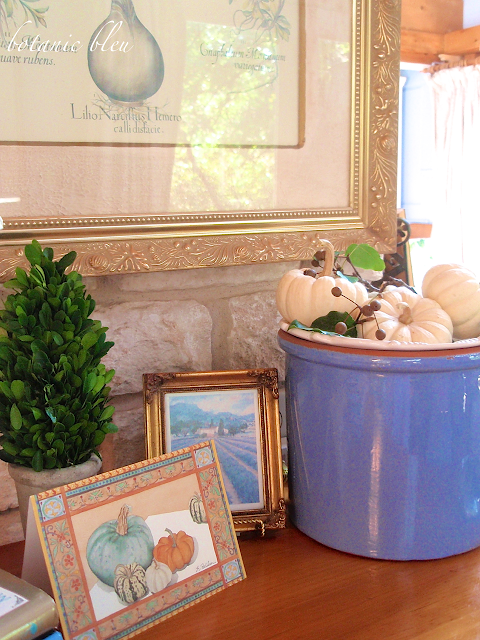 Keep it simple by adding a beautiful fall-inspired greeting card and a handful of Baby Boo white pumpkins to the French bleu flower pot. 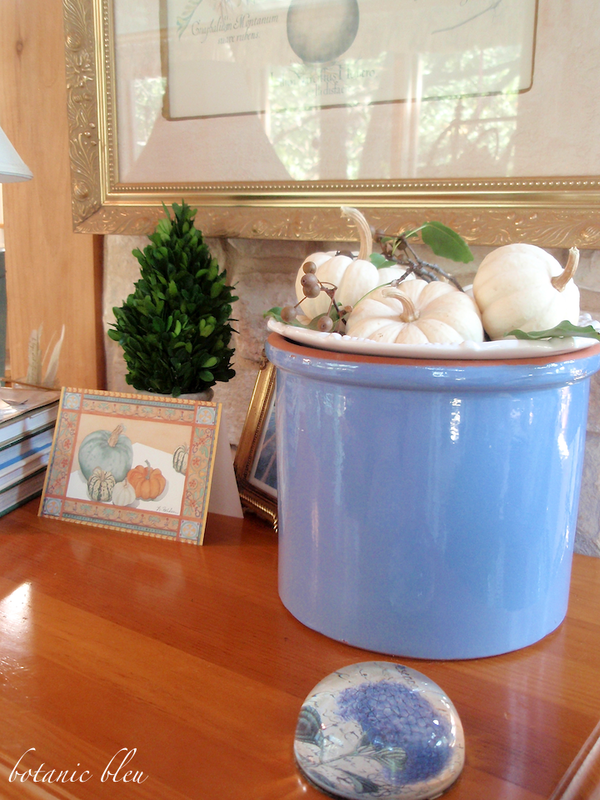 These two small additions to the top of the pine chest definitely add a seasonal look, but an understated one. Why not a more elaborate arrangement for Fall? First, adding just a few things keeps the overall design of the space intact. I like the way everything looks as it is, and I am slow to change. 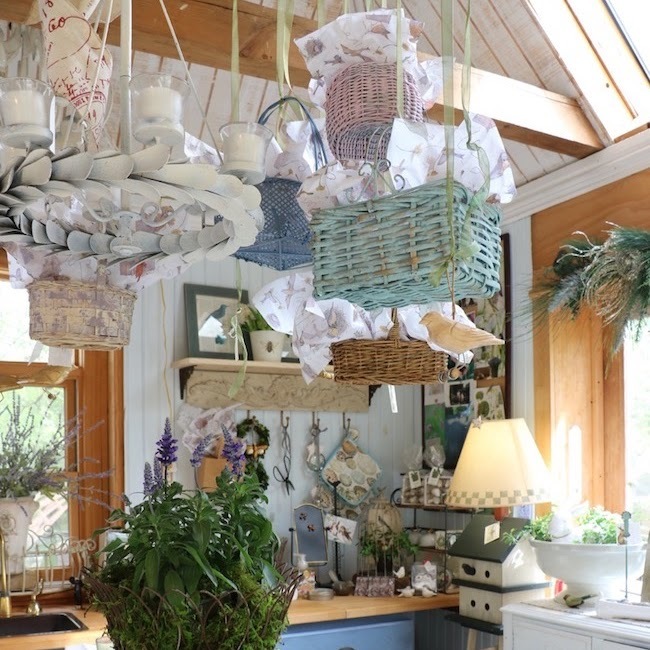 It takes me a long time to choose new things for my house. 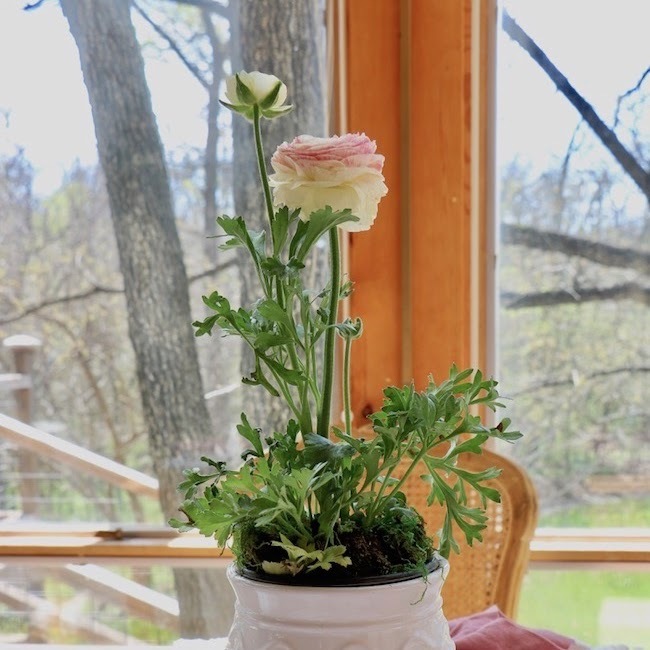 So, when I finally make a change like buying a new sofa, or adding a new lamp, or finding just the perfect French bleu flower pot, I enjoy seeing them. 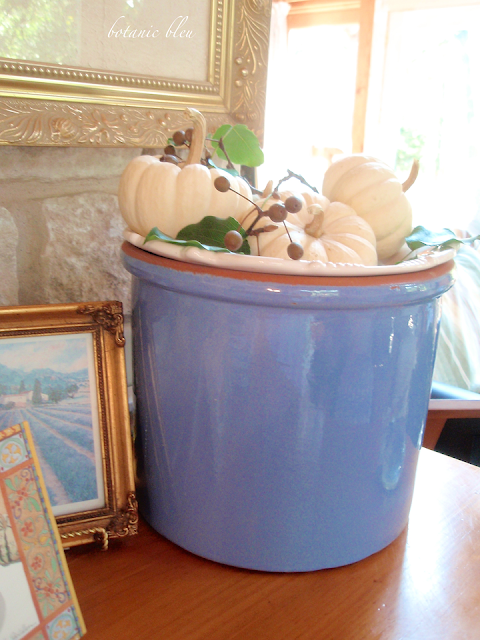 This flower pot's color is my personal favorite bleu. This bleu has a lot of red in it and can be very hard to find. 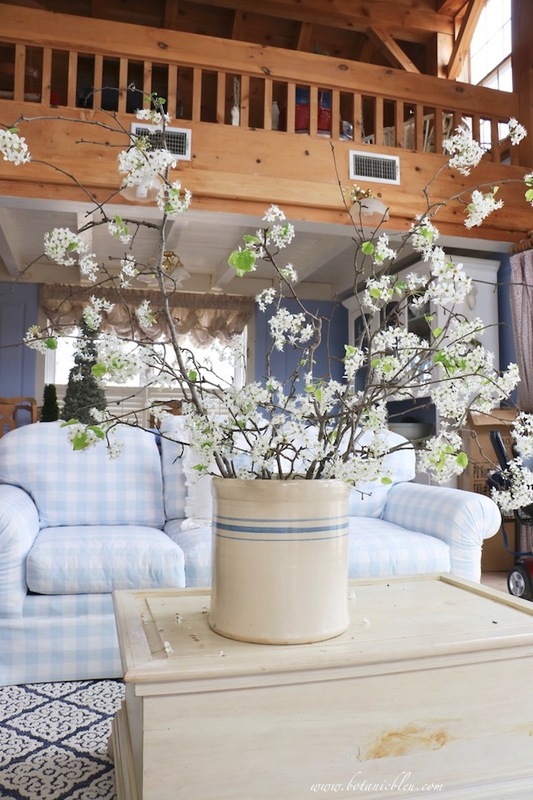 Several years ago this shade of bleu was available in fabrics, pottery, ribbons, lamp shades, bed linens, upholstery.... , but is much harder to find now. You probably know that the design world chooses a focus color each year, and manufacturers make many things in that color. Then the next year there is a new focus color, and the old color-of-the-year is harder to find. Made popular by Laura Ashley, this color is called periwinkle blue and tends to look purple when paired with some other shades of blue. I love this bleu, and buy it whenever I find it! 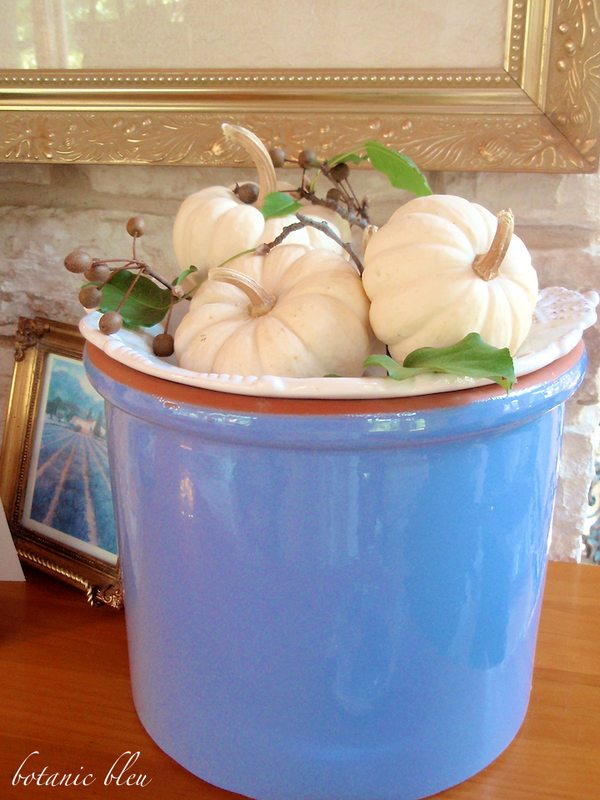 Don't the white pumpkins look great with this bleu? Remember one of the tips from the last post was to provide a royal setting? Second, adding just a couple of Fall touches allows each of the touches to be a focal point instead of them getting lost in a mix. Using just one card showcases that card with its designer pumpkins, and the Baby Boos are eye-catching elevated in the flower pot. Third, adding only a few things makes it easier to clean. Cleaning is not high on my list of things to do. Since there are so many more things I had rather be doing, anything that makes the job go faster makes me happy. 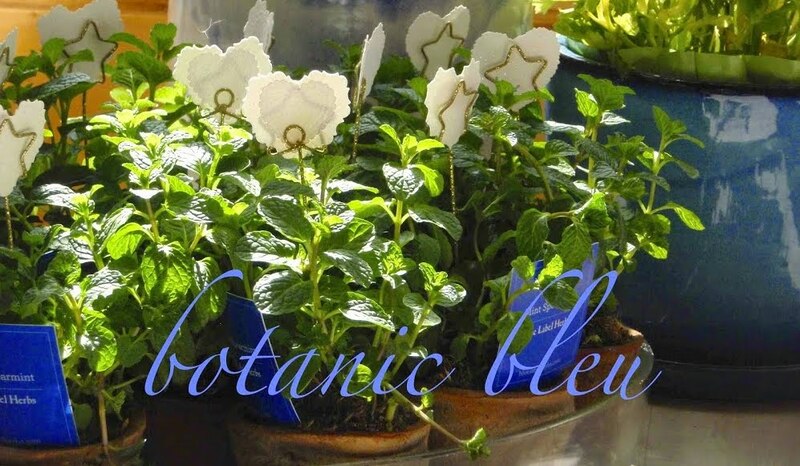 The card is easy to pick up and move around for dusting, and the little white pumpkins are inside an existing pot which means they do not add to the cleaning routine. Fourth, adding only a few Fall touches keeps my budget intact. 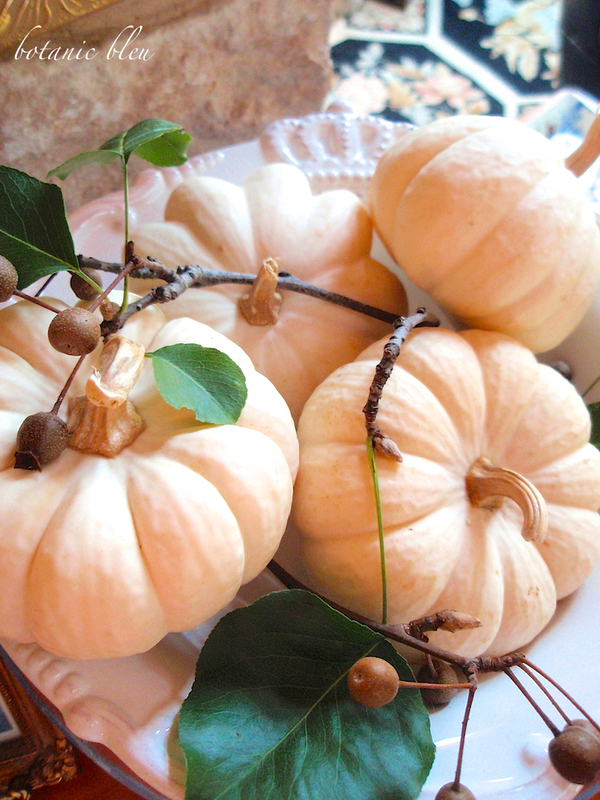 The small white pumpkins are inexpensive and by placing them in a shallow white bowl, only a few are needed. The few sprigs of greenery are Bradford pear leaves and berries from the pear tree in the backyard. The price doesn't get any better than free. 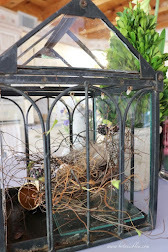 Lastly, adding just a few inexpensive natural items does not require storage space once I change out the decor. Organic items compost naturally in the woods and become soil instead of taking space in a landfill. 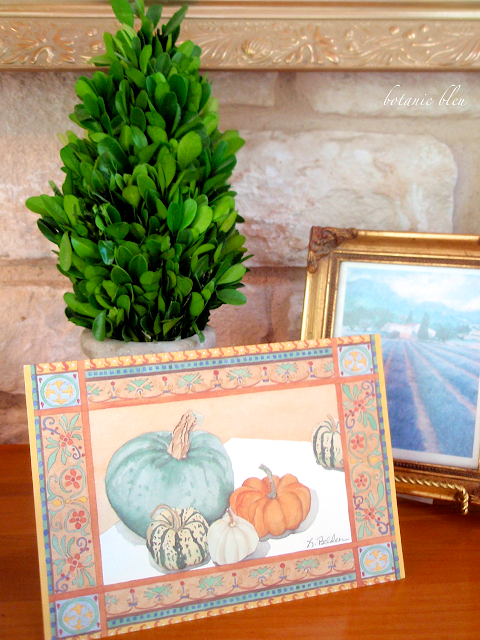 Even with minimal Fall decor, there is also a French touch. See the embossed crown in the lip of the white bowl holding the pumpkins? 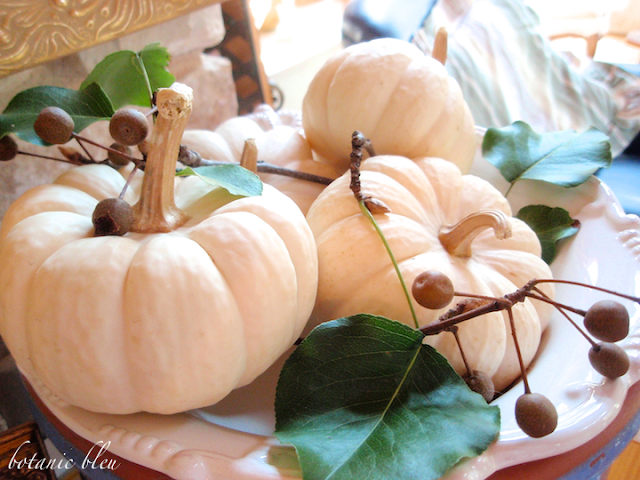 Plus, using real pumpkins and pear twigs is très français. Au naturel. and I will try to have at least a few special touches for you to enjoy. Judith, I agree that this is the perfect touch. What did we do before baby boo pumpkins? Your home is so serene and beautiful. 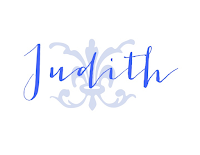 Judith, I love your style! And that shade of bleu is perfection! Baby boos, Cinderella pumpkins, twisted and personality filled stems oh yes this is the season I love and adore. Pretty photos and delightful post. I do know that special shade of blue. It is a beautiful color and does lean toward purple as you say. Your baby boos are sweet and add to the beautiful look. I can't get over how gorgeous that blue is! 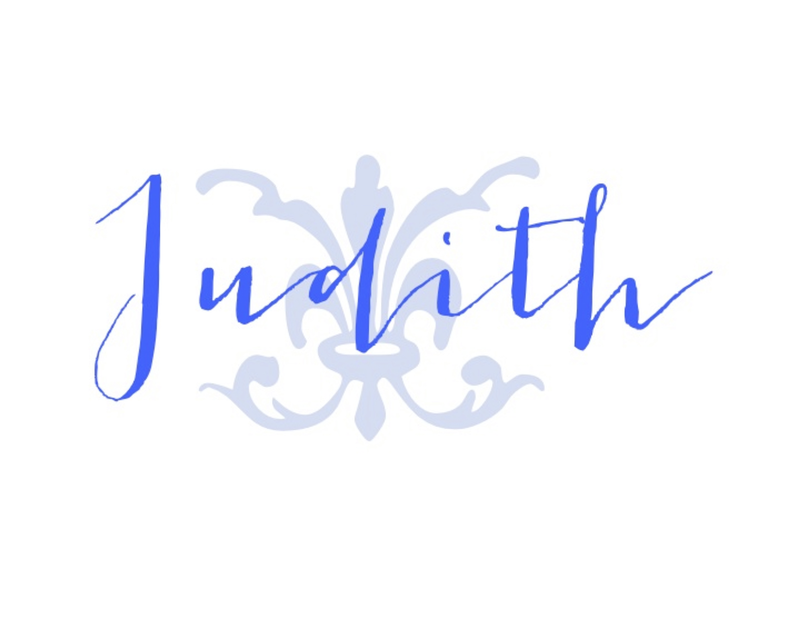 Judith, everything is so pretty and I love that color! 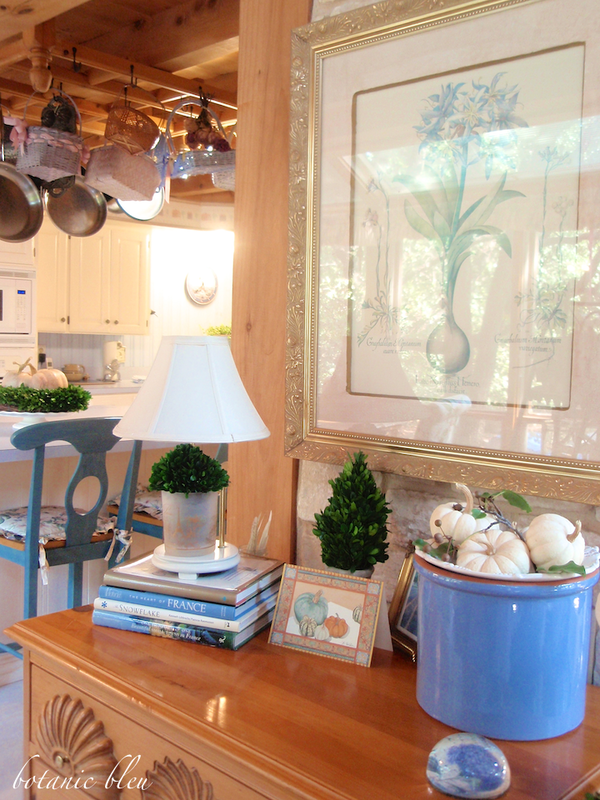 The pot and the small touches make such a huge statement. I didn't know about the color of the year thing...guess I'm really far out of that loop because my colors are always so neutral so that I can add other colors easily. This is just so pretty and elegant! Hugs!! Love how you've incorporated, with a very light touch, some Fall in with all the things you already love. I remember that beautiful shade of blue from when I had a sewing business. It seemed it was most often paired with shades of yellow -- still one of my favorite color combos. 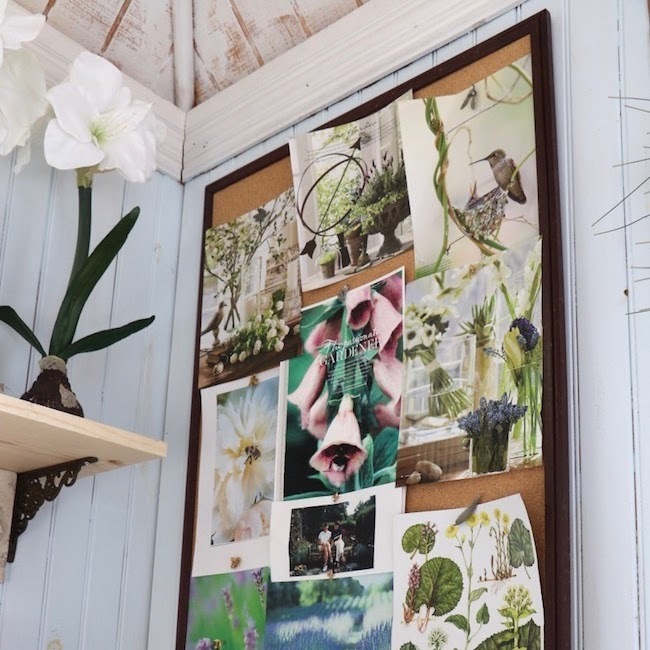 I love the way you share your creative process Judith. Can't think of a prettier place for baby boo's. I like the baby boos with the french Bleu! I used to think Fall had to be oranges and browns, but I see lots of people uses blues and even pinks which I think is so fun! We are on the same wave length this fall. I had some baby boo's come up from compost and I just brought them in. It is pretty much the extent of my 'Fall' decor inside this year.